Worship — what comes to mind when you hear or see the word? Do your thoughts gravitate towards words such as adoration, exaltation, jubilation, and praise? Or, do you possibly consider words such as admire, idolize, or even respect? Do you think of rock stars, Hollywood celebrities, idols, perhaps church, or how about God? How do you define worship? (noun) reverence, homage or honor paid to God // ceremonies or services expressing such reverence; public worship // an utterly devoted admiration for a person; ‘Your (His) worship’ (esp. Br.) a courtesy title used to (or of) certain magistrates, officials, etc. 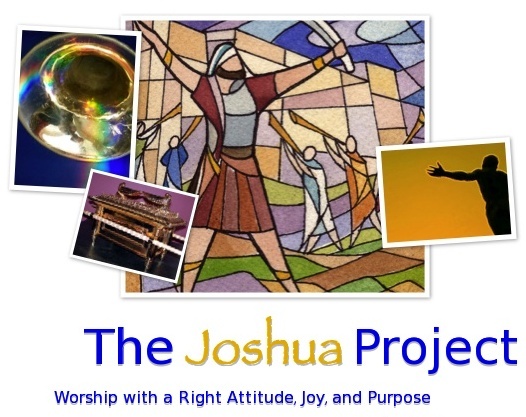 As we have discussed in our worship series The Joshua Project, by defining worship as a noun (person, place, thing, or idea), Merriam-Webster is indicating that the word has physical characteristics, variables, substance — belonging. But the word “worship” can also be defined as a verb. In the Life Application Study Bible (NIV) the definition states, “to express praise and devotion.” This definition reveals activity . . . involvement . . . choices being made. So, which is it? Is worship something physical, tangible, and full of substance, or is worship an activity; something we choose to participate in? Worship actually is both; the blending of two definitions — the noun and the verb. The best example of this mixture of two definitions is in the Hebrews’ view of worship. In the book Called To Worship: The Biblical Foundations of Our Response to God’s Call, by Vernon M. Whaley, we read that the Hebrew word used for worship is shachah, which means “to kneel, bow, prostrate yourself, or throw yourself down in reverence.” But there are four other very closely related words that Mr. Whaley says broaden the Hebrew description of worship; words that reveal the heart of their worship. These four words are: shabach, “to shout out to the Lord”; yadah, “to worship with raised hands”; tehillah, “to sing impromptu, spontaneous songs of praise”; and halal, “to celebrate God foolishly and boast about His attributes.” His attributes being faithfulness, goodness, love, mercy, etc. (see Galatians 5:22-23). Can you see the blending of the noun and the verb? If not, allow me clarify further. A parasol, or umbrella, is a thing which is used as a protective covering. A parasol is designed to protect us from the harmful affects of the sun’s rays. This compound word originates from the Latin words “parāre” (meaning to prepare for or against) and “sol” (meaning sun). So a parasol prepares you to be protected against the sun. An umbrella is usually designed to keep us from getting soaked when it rains. The origins of this compound word stems from the Greek prefix “ómbros” (meaning shaded or shadow) and the French suffix “elle” (meaning little). So an umbrella is basically a “little shadow.” Its association with being a protective canopy against the rain stems from the French variation of the word parasol (parapluie). The suffix “pluie” (which originates from the Latin word “pluvia”), simply means rain. Thus, a parapluie, or umbrella, prepares you to be protected against rain. But the parasol, or umbrella, can only protect us if we take hold of them . . . open them up . . . make use (verb) of their physical properties (noun). It is the same for worship. Worship — true worship — is the covering that shields true believers from God’s perfect and pure holiness and allows us to linger in His presence. Worship — true worship — prevents true believers from being distressed when God tests their faith (a.k.a. : rain and storms). But again, worship can only do this if true believers take hold of it . . . open it up . . . make use (verb) of its matter (noun). 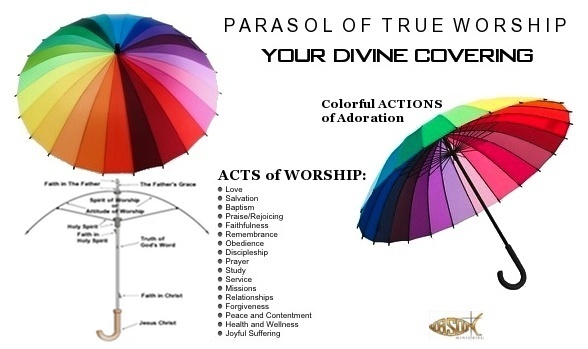 In this new series, Parasol of True Worship: Your Divine Covering, we will look more closely at how a parasol, or umbrella, is made. We will then compare those pieces to various aspects or actions of worship, so that we who have become true believers can better understand how to incorporate worship into our daily lives. Doing so will allow us to understand more completely how to linger in God’s presence, better endure hardships, and shine the light of God’s divine love to the lost and dying world that we live in. So join us as we examine our “parasol of true worship,” and together we’ll take hold of it . . . open it up . . . and make use of its colorful and varied substance. Parasol of True Worship: Your Divine Covering by J.Scott Harden is licensed under a Creative Commons Attribution-Noncommercial-No Derivative Works 3.0 United States License. Permissions beyond the scope of this license may be available at http://www.jsnmin.org/. Permissions beyond the scope of this license may be available at http://jsnmin.org/. All rights reserved. The brief information quoted from this book appears in this article with the permission granted per the copyright statement which appears in the publication copyrighted 2009. Published in Nashville, Tennessee, by Thomas Nelson. Thomas Nelson is a registered trademark of Thomas Nelson, Inc.
Thomas Nelson, Inc., titles may be purchased in bulk for educational, business, fund-raising, or sales promotional use. For information, please e-mail SpecialMarkets@ThomasNelson.com. This entry was posted in God, Jesus, Joshua, Nelson, parasol, Thomas, true worship, umbrella, uncategorized, Vernon, Whaley, worship and tagged God, Jesus, Joshua, Nelson, parasol, Thomas, true worship, umbrella, uncategorized by Jason Ministries. Bookmark the permalink. An interesting beginning. The parasol idea may indeed be a valid illustration. It seems like a broad definition of worship, so far, but I’ll keep reading. . . . Thank you for showing interest, Brian. This is a project that God laid on my heart several years ago. I am indeed starting broad and will bring it in as we move along in the series, then broaden back out again. I’ll look forward to hearing from you, from time-to-time, throughout the series. Interesting imagery! Looking forward to reading more. Thank you; please visit us again.